Omnitron’s Small Form Pluggable (SFP) and 10 Gigabit SFP+/XFP optical transceivers are interchangeable compact fibre connectors that enable a single network device to connect to a wide variety of fibre optic cable types and distances. CWDM Pluggable Optical Transceivers are used to customize iConverter®, FlexPoint™, OmniConverter™ and miConverter™ products to meet specific networking protocols and media requirements. They support single-mode dual fibre applications with Coarse Wave Division Multiplexing (CWDM) wavelengths. CWDM Pluggable Optical Transceivers increase network capacity by transmitting multiple data channels using separate optical wavelengths (1270nm to 1610nm) on the same fibre pair. These wavelengths are compliant to the ITU G.694 CWDM standard. Pluggable Optical Transceivers reduce network equipment inventories by eliminating the need to maintain surplus units/ devices of various fibre types for network repairs or upgrades. 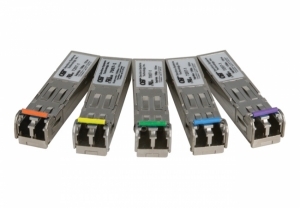 They also enable network upgrades and growth by providing interchangeable fibre connectors that can easily adapt to and modify any existing network. For example, a media converter that was originally used in a single-mode network can be re-configured to operate over a CWDM network by simply replacing the pluggable optical transceiver. Based on the MSA SFF-8472 standard, Omnitron’s CWDM Pluggable Optical Transceivers support digital diagnostic capabilities, providing enhanced diagnostic information to assist network administrators with network maintenance and management. When used in iConverter modules managed by Omnitron’s NetOutlook® SNMP Network Management Software with an Graphical User Interface or third party SNMP software, Omnitron CWDM Pluggable Optical Transceivers can collect enhanced, real time optical diagnostic information including fibre optic TX and RX power, voltage and transceiver temperature. By providing compact physical size and the ease of interchangeability, Pluggable Optical Transceivers provide a cost-effective and flexible solution for fibre optic network design. Please enter your contact details below with a brief outline of how we may be able to support you. One of our Engineers with then contact you to discuss your requirements further.